Centifolia Organic Floral Water with Geranium soothes the redness and discomfort sensations of delicate mixed to oily skins! Known for its astringent and purifying properties, it regulates excess sebum by reducing inflammation and soothes your skin. This organic hydrolat cleanses the traces of your make-up. 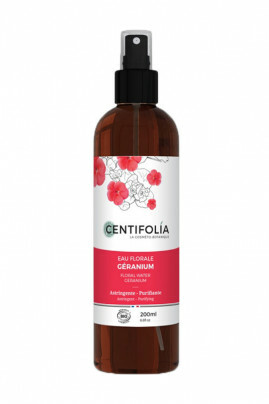 With Centifolia Geranium Floral Water Spray, your skin is moisturized and soft! Centifolia GERANIUM Natural Floral Water is perfect for mixed to oily skins ! Apply Geranium hydrolat morning and/or evening with a cotton pad soaked or sprayed, as a skin care product or simply to complete the make-up removal.